Why do people get wrinkles and gray hair as they get older? – Idiot’s Questions? How did Valentine become the patron saint of lovers? Which culture began celebrating the new year with a feast of food and alcohol? As people age, their bodies change in many ways that affect the ways their cells and organ systems function. These changes occur little by little, progress over time, and are different for every man and woman. We all lose height as we age, and by the time we reach 80 years old, our height may have decreased by two inches (five centimeters). Changes in posture, in the growth of our spine’s vertebrae, and joint changes all contribute to our loss of height. With aging, the hair follicles produce less melanin, the pigment that gives hair its color. 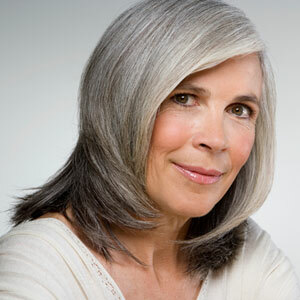 Hair becomes lighter, gray, and eventually turns white. The nails also change with aging: they grow slower, may become dull and brittle, and may become yellowed and opaque. With aging, the outer skin layer (epidermis) thins and the number of pigment-containing cells (called melanocytes) decreases, but the remaining melanocytes increase in size. Aging skin thus appears thinner, more pale, and translucent. Changes in the connective tissue reduce the skin’s strength and elasticity, resulting in a wrinkly, leathery skin. Previous Previous post: What is the difference between annual, perennial, and biennial flowers? Next Next post: Did all dinosaurs lay eggs?